(c) NY Times, February 2011. Todd Heisler/The New York Times Victor Elmaleh, who has dedicated much of his life to squash, playing at the Yale Club. He often invites top athletes to take him on. Sweat is a biweekly series about sports. They are well-heeled warriors. These squash players do battle behind thick glass at the courts of the Yale Club, in Midtown Manhattan, backed by a soundtrack of roars and grunts and lunging bodies slamming against walls. On a recent weekday, one of the liveliest contests was on Court 2, where an older man was running a much younger player ragged and whipping him in a succession of games. The younger man was soaked with sweat and heaving from exhaustion. The older was calmly holding position on the right side of the court, moving in a radius of a few steps and flicking returns all over the court. Both were going for the jugular, their intensity punctuated by brief moments of civility between points. The matchup: Victor Elmaleh, 92, versus Conor O’Malley, 31. In one game, Mr. Elmaleh, a longtime competitive squash player, was losing 13-9, but came back to win the game in a tiebreaker, 16-4. He took the next game as well, 15-9. But Mr. O’Malley is no pushover. A former college player and professional teacher, he now coordinates events for U.S. Squash, the national governing body and membership organization, and runs its team. And it would be wrong to assume he was letting the old man win a few. Mr. Elmaleh, chairman of the real estate development firm World-Wide Group, was born in Morocco in 1918 and grew up in Brooklyn. Living in Bensonhurst during the Great Depression, he played all the usual street games – stickball, stoopball, punchball, boxball. But handball grabbed his attention, and he honed his game on the courts in Gravesend, Borough Park and Manhattan Beach. He won a national doubles championship in 1951 and was a national runner-up in singles. 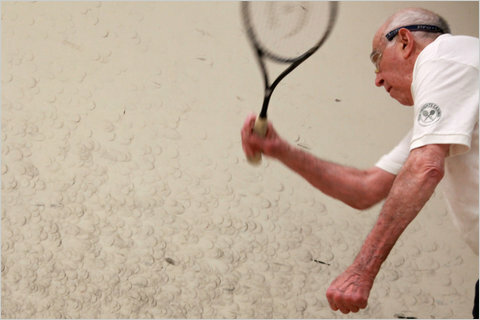 But soon after, he was introduced to squash at the City Athletic Club, and never went back. He laughed when he pointed out the headline recently. “Good thing no one ever told me,” he said. Many once-top athletes face the problem of how to compete with intensity as they age. Mr. Elmaleh has found a way. Through his longtime affiliation with great players, he invites top athletes to take him on. (As a wealthy developer who helps finance major squash organizations, he does have a certain level of access.) Then he gets them to agree to a couple of rule amendments. Mr. Elmaleh’s legs are “shot,” he said, giving him limited mobility. So, in their match, Mr. O’Malley spots him one main concession: He must hit the ball so it bounces in the quadrant of the court where Mr. Elmaleh remains. A top player can work within those parameters and hit hard, well-placed shots to challenge Mr. Elmaleh. “The better the player – and I mean world-class players – the better the game,” Mr. Elmaleh said. Another nuance is that they use a doubles ball, which has more bounce than one used in singles play. This prevents him from having to lunge to chase dying shots. After that, it’s on. Mr. Elmaleh does not need any more charity. His eyes are sharp, and he still has the old snap with the whippy squash racket.